Today's card is one of those SUPER easy cards that people like to touch and explore. 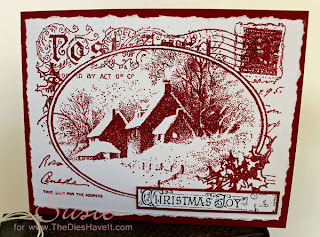 I used some red tinsel embossing powder on the Stampendous Snowy Postcard for my image. It is so super shiny - but still shows every part of the image. LOVE IT!! 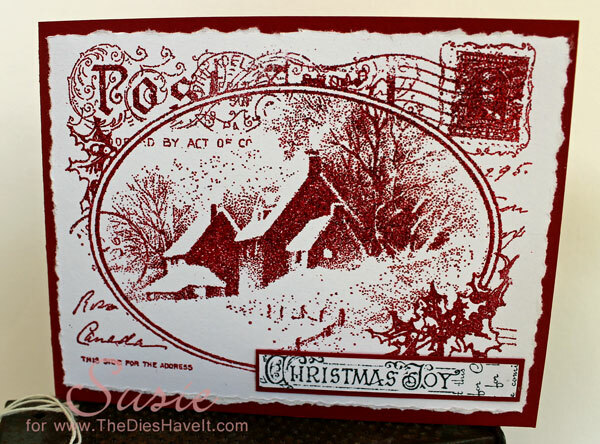 I distressed the edges of my image and then adhered it to a red card background. This was a quick card, but it doesn't look like it. That is one of my favorite tricks! Come on back tomorrow for a new digital layout. Wow....this image is just GORGEOUS!